The Universal DRSSTC Driver 2.7 Rev B (Oct 2014) - UD2.7C is the newest revision. 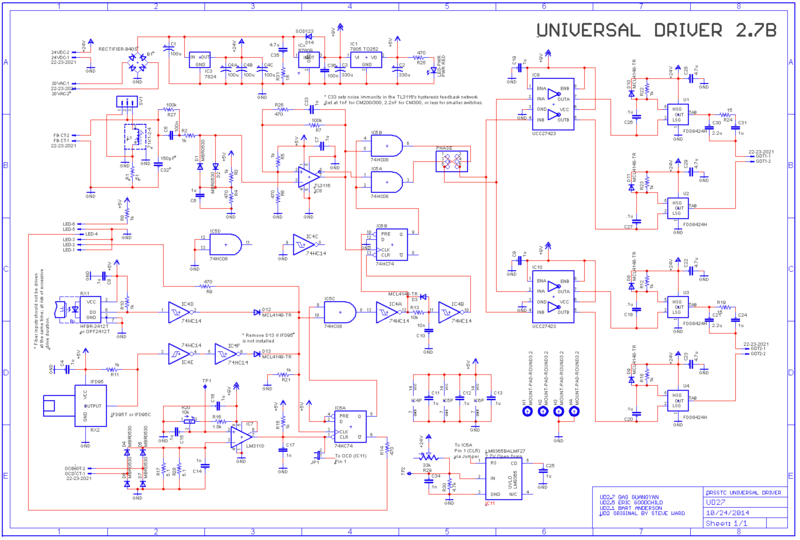 Here is my take on Steve Ward's Universal DRSSTC Driver 2 which I have named UD2.7. The UD2 is THE benchmark DRSSTC driver: it has stood the test of time and been used in thousands of high performance coils around the world. I came across Steve's original UD2 a while back ago, but there were several new features I wanted to incorporate. In addition, I thought it would also be a good idea to share a little bit about how the UD2 works and how to get one working, with the Tesla Coil community. Hopefully this will be a useful resource to hobbyists around the world. The UD2.7 (now in revision C) has since been used successfully in a variety of coils, ranging from small table top 400kHz DRSSTCs, 35kHz large DRSSTCs with a full bridge of CM600 IGBTs and even QCW operation (see application notes below). This project will not be possible without the work of the following people. Many thanks to Steve Ward for his generosity in sharing the UD2 with the Tesla Coil community, and for his permission for the modification and publication of this new version of the Universal Driver. The UD2.7 is free for download for personal hobby use; credit and all rights of the UD2 design goes to Steve Ward. Also, credit goes to the many improvements made by Bart and Eric in the earlier V2.1 and V2.5 revision, which added lots of cool features. At the moment I'm quite happy with the UD2.7C revision, and any new features will probably be incorporated in a completely new driver design I will be working on in the future :-). Feel free to drop me a note if you've successfully used this in your project or if you have any neat suggestions or comments! See this 4hv forum thread for questions, discussions and answers. This page will also be continually updated. If there are additional changes desired / comments / feedback, please let me know for a future revision of the board. 24VDC Input - Small error in the UD2.7A and B design which has been fixed in the UD2.7C; also does not apply if you are only using the AC input jack. Otherwise, there is a simple fix if you are using the 24VDC input jack for the Rev A and B boards: solder on a general purpose diode across the 24V regulator from output to input (i.e. standard reverse protection diode). See below for more details. C33 - C33 sets the dead time for the TL3116 comparator hysteric feedback network for switching noise immunity. The pads for the capacitor are increased in size for easy changing of components. Good values range from 220pF to 2.2nF. 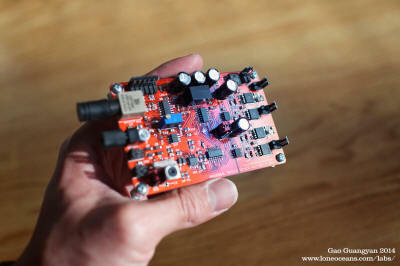 For large IGBTs at low switching frequency (e.g. CM600), use 2.2nF. For medium sized switches like CM200, 1nF works well (change C33 to less than 1nF for operation above 200kHz). For faster small IGBTs such as TO247 IGBTs at higher frequencies, use 220pF. Adjust C33 if noise is found on the output of TL3116. Fiber Units - The UD2.7 allows the use of two different kinds of fiber optic input (the ST-type, and Industrial Fiber Optics type). Use OPF-2412T or HFBR-2412T for ST fiber receivers, & Industrial Fiber optics IFD95T or IFD95C (these are Active-High, be careful that you do NOT buy the active low kinds). The fiber units are ORed together, so be sure to ONLY use one port for interrupter input to avoid excessive pulse-widths. They can be installed individually by themselves to save cost. D13 - You can install both, only the ST, or only the IF receiver to save cost. However, because the IF receivers are active high, if you only install the ST receiver, you must remove D13 to prevent the interrupter line from not being pulled low. Slot-7 Inductors - These 7M3-series tunable inductors for phase lead adjustment can be bought or sampled from www.coilcraft.com. Inductance values varies depending on your switch and switching frequency. Typical values include: 7M3-123 (9 - 15uH; works well with TO247 IGBTs), 7M3-153 (11 to 19uH), going up through 7M3-223 (17-28uH), 333 (25-41uH), 393 (29-49uH; works well with CM200/300s), 563 (42 - 70uH) etc. Use a flat-head non-magnetic or plastic screwdriver for tuning. Output Drive - UD2.7 has two identical outputs for driving two bridges, or can be paralleled to run a large bridge. To save cost, the second gate drive section can be removed - anything after the phase jumper can be removed for the second circuit, including the UCC Mosfet drivers and the push-pull MOSFTs. Feedback - I try to aim for about 1A of feedback current; adjust your CT turns ratio appropriately. OCD Burden Resistor - The OCD burden resistor (R17) is a single 5.1R 2W by default. For flexibility, an second parallel space at R28 is provided for an optional secondary resistor. 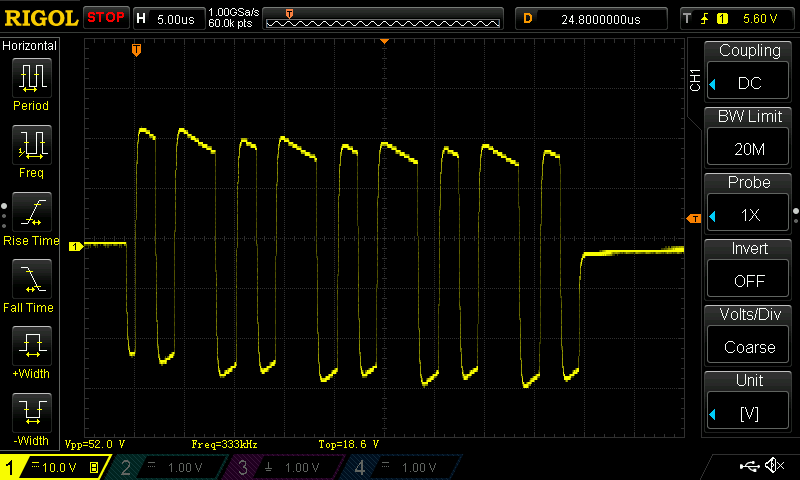 The comparator voltage should ideally be less than 7V to keep within the bounds of the comparator when on a 9V rail. Setting OCD Current Limit / Phase lead - See application notes below. 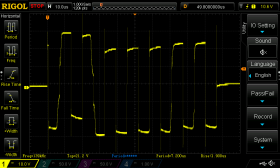 UVLO Setting (for UD2.7B onwards) - UVLO trips when the voltage sense line drops below 2.7V (or 4.5V depending on the part you use). This is set in UD2.7A with a 33k/4.7k resistor divider across the 24V rail giving about 3V, for the UVLO to trip when the 24V line drops to 21.65V or so. In UD2.7B onwards, R29 is a 50k pot which can be adjusted greater than 33k for a faster trip, or a less than 33k for more leeway in 24V drop. Tap point 2 (TP2) is conveniently located near R29 for easy voltage adjustment. 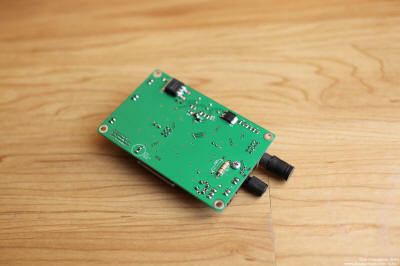 This can be set to 3.0V (or 5.0V for the 4.5V trip). 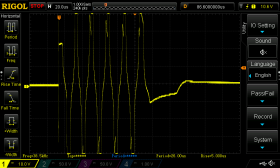 Note that the maximum voltage the LM8365 can tolerate is 6.5V. By default, R29 (50k pot) comes set to half (25kR resistance). 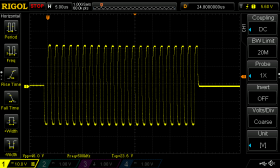 This gives a safe voltage of around 3.8V by default which should be adjusted. However, IF R29 is set to say 0R, this can place a very high voltage (>6.5V) to the LM8365 causing it to pop! Be careful when installing R29! Board layout of UD2.7C showing top traces (red) and bottom (blue) with silkscreen (white). For more information / documentation , please read below. 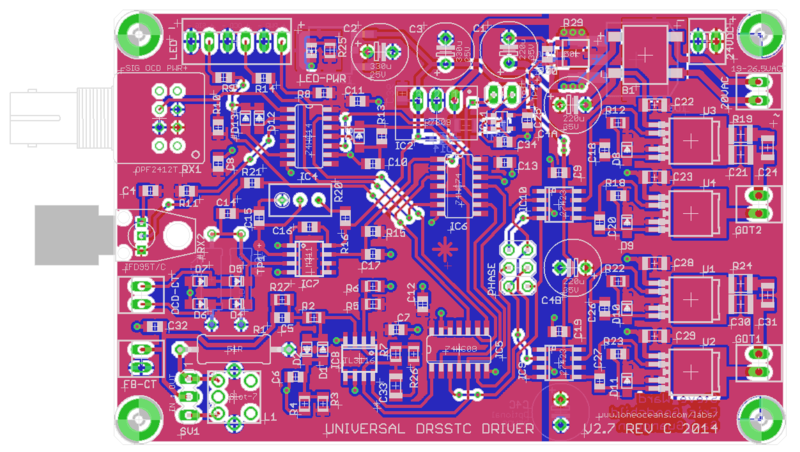 The UD2 is a universal DRSSTC driver / controller board originally designed by Steve Ward and is an evolution of this UD1.3. The UD2 accepts a fiber-optic interrupter input and is capable of driving some large GDTs for DRSSTC operation. Its' main feature is an adjustable phase-lead controller. It has had a proven track-record in the field and has been used by many serious hobbyists around the world. 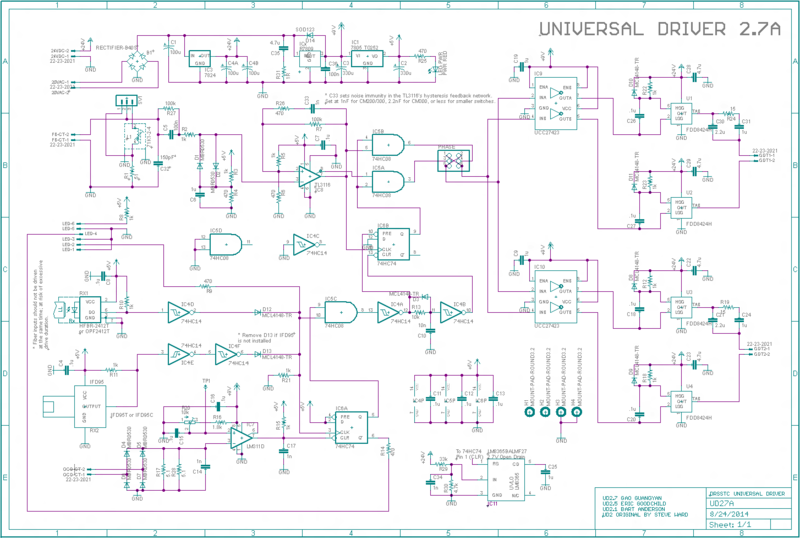 Steve Ward created the original Universal DRSSTC Driver (referred to UD from now on) back in 2008, and was designed to be a general purpose solution for most conventional DRSSTCs, yet powerful enough to drive a large full bridge of transistors. It featured the usual primary feedback circuit with a flip-flop, optical interrupter input, over-current detection (OCD) as well as robust MOSFET driven Gate Drive Transformer outputs. Version 1.3b was popularized on his website and has been successfully used by many hobbyists around the world. In the quest for a better controller, Finn Hammer came up with a clever idea of using Phase Lead in his driver; a feature which he called 'Prediktor'. 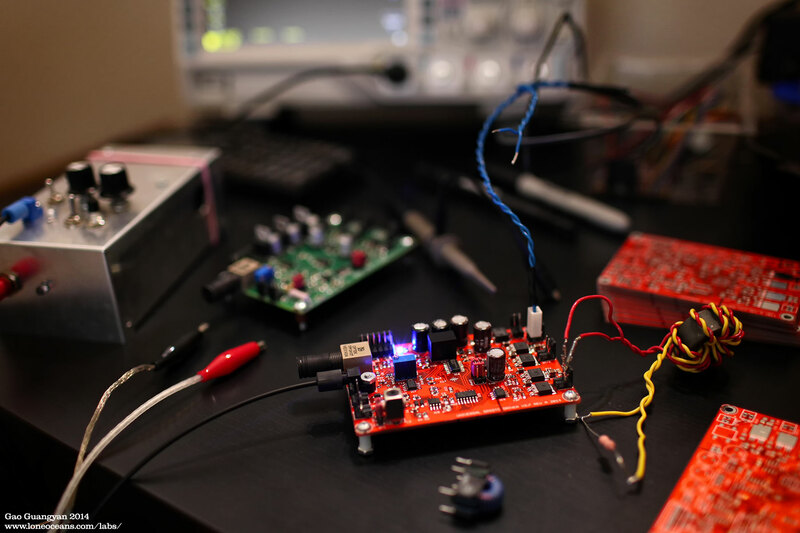 In essence, a little bit of phase lead is added to the input signal to the driver. The result is that the power transistors can now be switched slightly earlier - this is desirable because large IGBTs have a non-zero switching time, and switching earlier allows for perfect zero voltage switching. From this, Steve Ward developed a newer controlled dubbed the UD2, which uses this idea and adds adjustable lead compensation via a variable inductor in a LC feedback network. Since then, several improvements and fixed have been made to the UD2 such as the UD2.1B by Phillip Slawinski and Bart Anderson, as well as a more recent improvement the UD2.5 by Eric Goodchild; a shout-out to them for their work! These improvements have resulted in additional features such as small fixes, addition of an additional fiber input, component placing, and other tweaks. Many thanks and credits to these folks who have contributed back to the Tesla Coil community. However, there were still some problems left which I really wanted to improve and use in my own projects, so I decided to do my own revision on the UD2. I don't know what the naming convention is but I've decided to call it UD2.7. I've built on the work contributed by the Tesla Coil community, but all rights are still reserved by Steve Ward who originally created the UD2! Some of the main problems I had with the UD2 were the linear voltage regulators, especially the 9V and 5V regulators which had a habit of getting very hot with reports of them exploding due to heat/overvoltage. The original UD2 placed the regulators in a very awkward position which was difficult to heat-sink. This was addressed in UD2.5, but I really wanted to do away with heat sinks for reliable long-term enclosed operation. In addition, the UD still did not have a Under-voltage Lockout, which I think is essential. I also wanted to improve the hand-solderability of the board, and make the board easier to use. I made a list of improvements I wanted and implemented them. 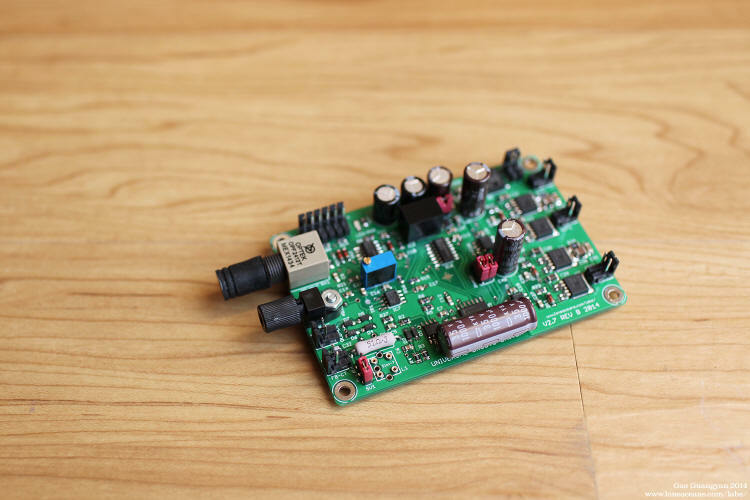 The result is what I hope to be a more physically robust board, as well as a driver that is more reliable for long-term operation in a confined space. These are some photos of the completed and assembled board. These photos show the UD2.7A. Above in green is a slight revision to the UD27A - the UD27B. It is essentially identical except for a few tweaks, and has added space for an optional large drive capacitor (C4C), along with UVLO adjustment. As mentioned, one aspect of previous UDs were that the linear regulators (especially the 9V one) got really hot. I wasn't keen of the idea of heat-sinking, so I replaced the regulator with a switching one, mounted the other two on the bottom of the board, and added appropriate copper tabs using the ground plane of the board as a heatsink. 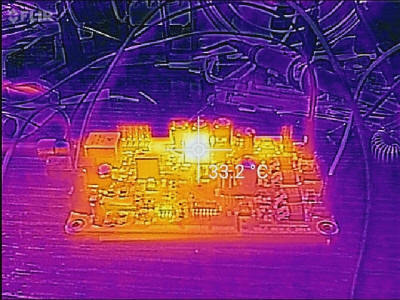 I used a FLIR thermal camera to see how warm these components would get when fed with 20VAC, with an ambient temperature of 24C. After 5 minutes of idle time, the hottest parts of the boards were still the regulators with the 9V switcher topping out around 33+C and the 5V regulator at about 32C. The bridge rectifier and the 3116 were also very slightly warm. 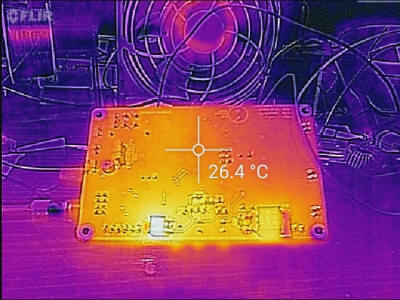 Regardless, a significant improvement over the previous boards which had regulators that ran closer to 70C! In typical use, the main regulators and switching FETs will get much warmer, but it is likely that the main inverter switches will be more thermally limited than the UD2.7 driver board. How does the UD2.7 Work? 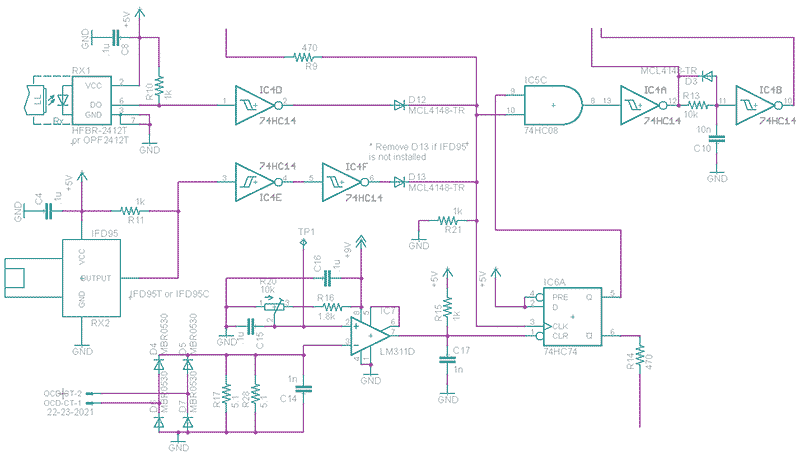 If you're tinkering with a UD2, you should already be quite familiar with DRSSTC controls and should be able to figure out how to read the schematic. I've seen many beginners wanting to build their first DRSSTC with a UD2 without prior experience. While possible with a lot of work, in my opinion it is definitely a much better idea to begin with a simpler controller such as a standard primary feedback driver, before moving on to a more complex driver as the UD2. Some things to note include the ability to use either a 24V SMPS or a 18-20VAC transformer. A roughly 30VA power source should be more than sufficient for most coils. Be sure to ensure that you are plugging the power supply in the correct input jack as labeled on the board since there is no protection for the DC input jack. For CT feedback, I aim for about 1A of feedback. OCD trip values work best around 2 to 7V. The GDT outputs can also be wired in parallel for driving a large bridge of IGBTs such as CM600s. Note that the above photo is of the UD2.7A. The B revision onwards includes an extra jumper for UVLO as well as a potentiometer for adjusting the UVLO set voltage (via Tap point 2), and extra space (C4C) for more 24V rail capacitance. How does the UD 2.7 Work? 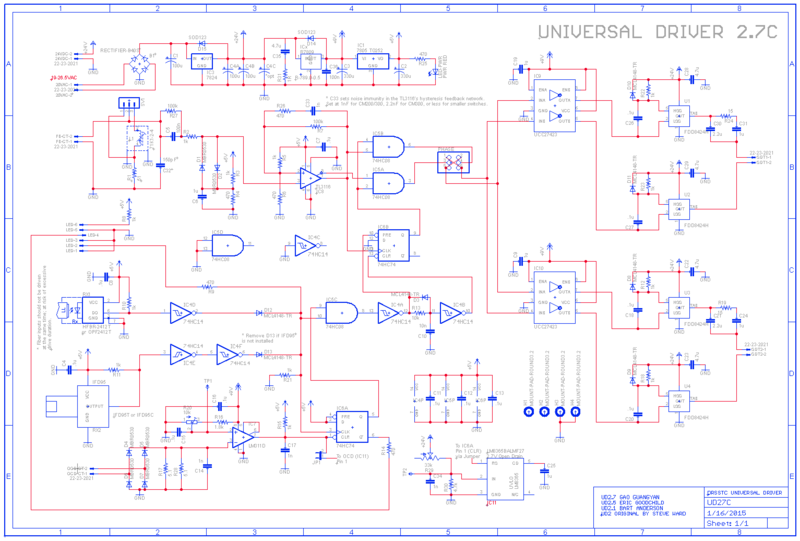 Here is the complete schematic for UD2.7 updated with my modifications and presented with permission from Steve Ward. 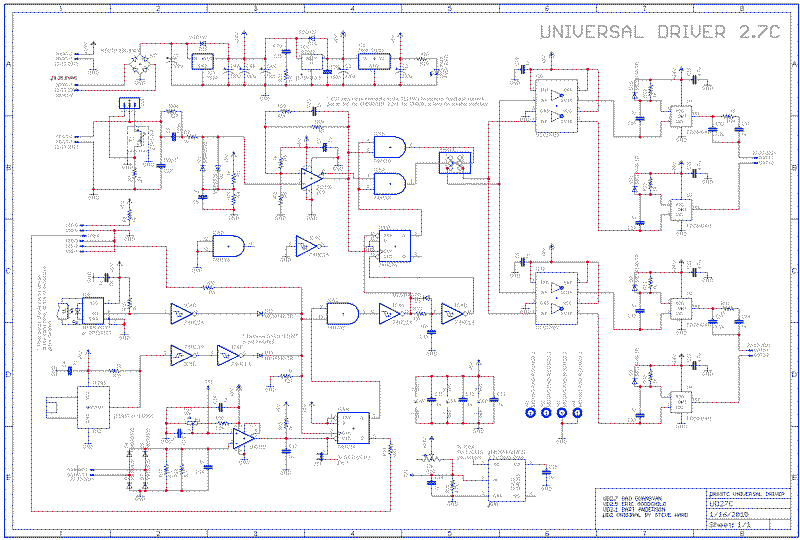 UD 2.7C schematic - click to see in full resolution. Let us go through overall the different components of the circuit. I won't go into them with too much detail, but if you have any experience with electronics, you should easily be able to figure out out all by yourself. For previous versions, note that the Rev B has a few tiny changes to Rev A. Also, if you find any mistakes that I have made, please let me know! [Update - Errata found in the 24VDC input jack with simple fix - see here for more details! - this is fixed in Rev C where the 9V regulator is now daisy-chained off the 24V regulator]. The gate drivers are straightforward and designed to drive Gate Drive Transformers. The input signals are the opposite of each other, and are the logic equivalent of the GDT outputs. These come in to IN_A and IN_B of the UCC Inverting Mosfet drivers (note that the UCCs here are always enabled). To amplify the signal for a much stronger GDT drive (basically just to beef it up), the output drives the gates of two Dual N/P channel 40V 20A MOSFETs, which create the +-24V signal to the GDT output. Note that driving your IGBT gates at 24V is over typical maximum operating characteristics of almost all IGBTs! There are several reasons for over-driving the gates though it is not a topic for discussion here. 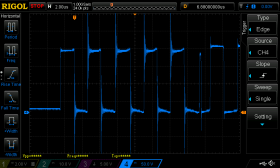 Suffice to say it is possible to have a lower input on the 24V rail all the way down to around 11-12VDC as long as it is sufficient for the 9V regulator's input. Adjust the UVLO accordingly. The labeling is a bit confusing here - TAB corresponds to D1 and D2, S1 is tied to GND, S2 (of the P Channel FET) is tied to 24V. 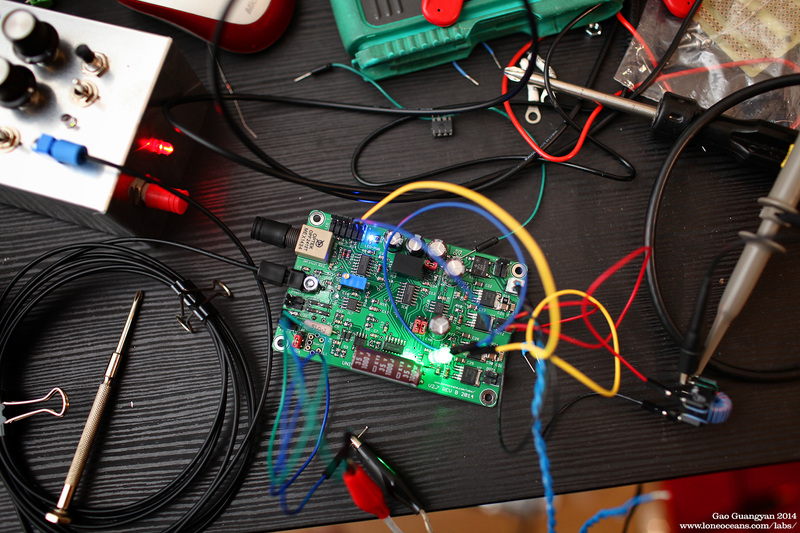 Output of the UCC begins as high (9V), turning on the N channel FET and pulling the output (TAB) to GND. At this time, G2 (pin 5) is pulled by R22 to be 24V, so the P Channel FET is off. 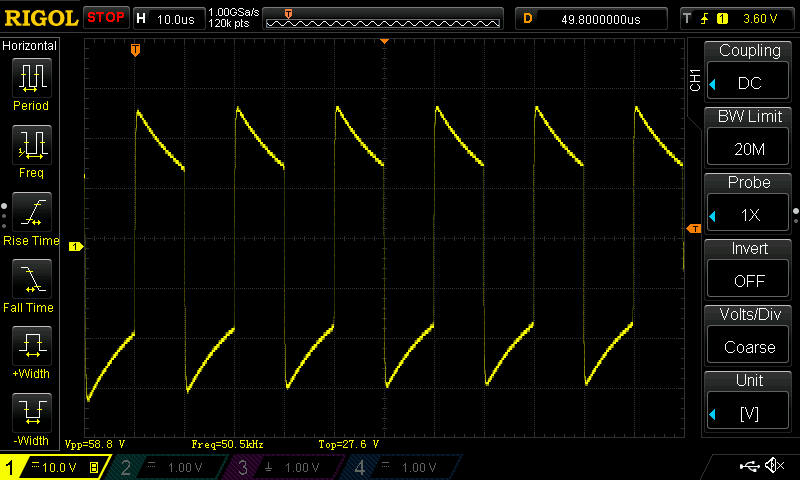 When the UCC begins switching, OUTA/B goes to 0V, turning the N channel FET off. The signal is capacitatively coupled via C26, creating a square wave signal same as in the drive signal on pin 2 as pin 5, but shifted by 24V (so about 24V to 15V). The FDD8424H pair here has a very low gate threshold V_gs voltage of 1.7/-1.6V N/P. This causes the N FET to go OFF, P to go ON, causing TAB to swing to 24V. Likewise, this happens the same way on the other pair, creating a 24V push-pull output for the GDT. The diode (D10/11) is necessary to clamp the P-FET gate to a maximum of 24V. Otherwise during the 0V to 9V transition, the P-gate will jump from 24 to 33V. D10/11 allows current to flow through during the transitions in on direction, keeping the gate to a 24-15V drive waveform. Notice that the output from the push-pull pair is capacitatively coupled via the C30, a beefy 2.2uF MLCC capacitor. This is important as it prevents 'flux walking' on the GDT and eliminates any DC bias which can lead to core saturation. R24 is a 15R resistor that damps ringing with the leakage inductance of the GDT and circuit capacitance which might accidently turn on the IGBTs on the GDT secondary. To prevent burning out R24 in the event of a malfunction (e.g. suppose the driver is stuck on high and low on both sides, there will be 24V across the resistor for a long time which could burn it out), C31 is added as a DC blocker. This circuit is duplicated twice for two outputs. The UD2.7 is simply a feedback driver at its heart, and feedback is usually obtained from the primary circuit via a current transformer. The UD2 adds phase lead functionality, where the feedback signal is fed into a LR circuit, which adds some lead-time into the feedback signal, adjustable by the inductance of L1. We know that across an inductor, the current lags the voltage (and opposite across a capacitor, where the voltage lags the current). This is the way phase lead is introduced by the inductor, where the feedback current is lagging the voltage signal, and it is this voltage signal we are sending to the fast TL3116 comparator. 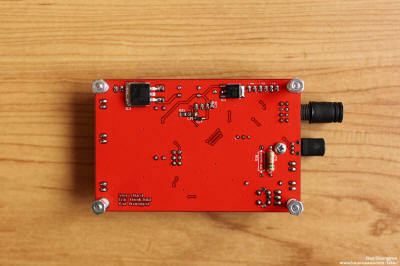 The signal is then clamped to 5V via D1 and D2. 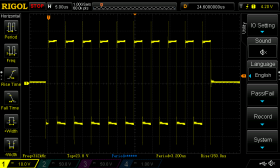 The resistor divider pair off-sets the signal at around 1.6V for optimal comparator operation / switching. Note that TL3116 can be replaced with a variety of fast pin-compatible comparators. The phase lead voltage signal is sinusoidal in nature, which can lead to a variable output delay when fed into a comparator with a wide hysteresis band. As a result, the phase lead circuit uses a relatively high voltage across the LR filter (~50+V across the 51R at 1A), and then fed through a resistor into a diode clamp to make it into a reliable square signal clamped by the diodes. Note that during the beginning, the feedback voltage starts off small, so the comparator needs to have a small hysteresis band to avoid noisy switching, so that the delay between zero crossing feedback and the comparator output change is small. The high voltage minimizes this switch delay, especially during startup. The TL3116 is a fast comparator which overall acts as a zero cross detector, and the two ouputs (inverted and non-inverted) go into IC5 (AND gates) which go into the enable pins of the main drive circuit. 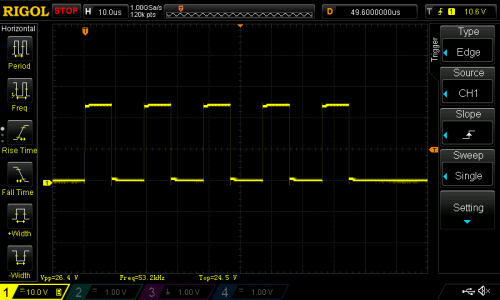 This output also acts as a clock signal to the 74HC74 D Flip flop. The output of the flip-flop (Q) must be logic 1 for both the AND gates to send an output to the drive. The flip flop therefore acts as the control to turn on and off the drive, and this can be achieved by forcing Q to go high or low. 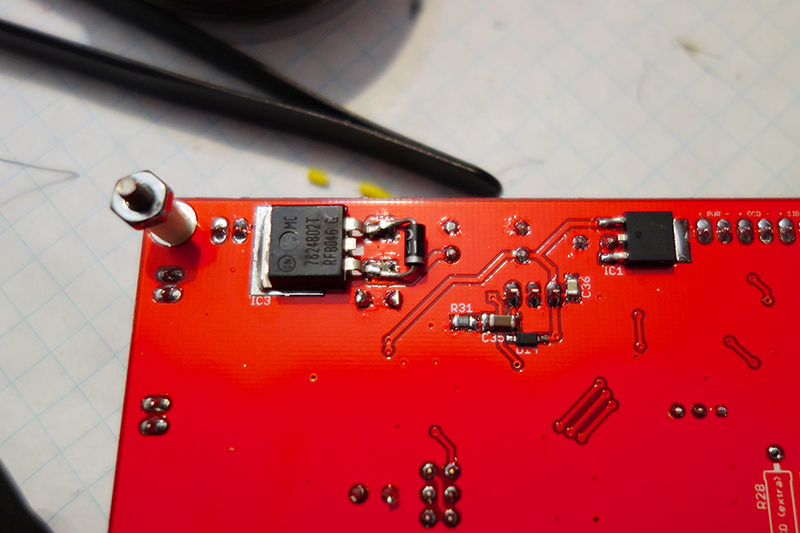 We will see how the interrupter input turns on the drive signal, and this can be stopped by OCD, end of drive, or UVLO, all sycned to a zero-crossing by the flip-flop (where the output of Q only changes at the next rising clock edge). 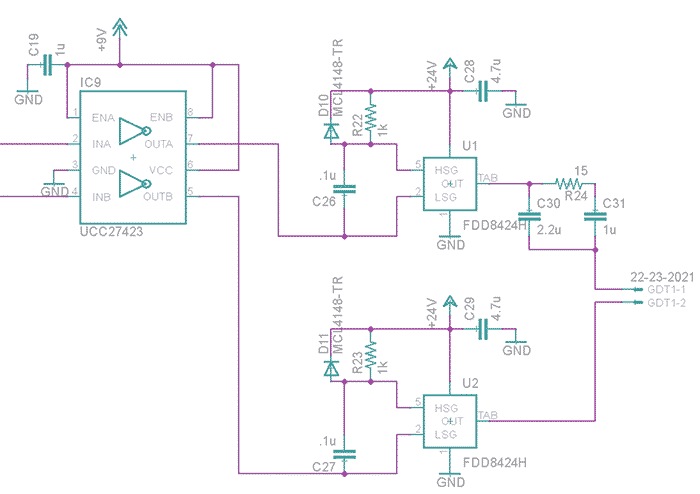 One effect of this is that the flip-flop can only shut off the drive at rising clock edges, so depending on the phase of your feedback, it can either shut the drive at n cycles or 0.5+n cycles. This also means that the current can potentially grow for about 1.5 half-cycles at worse case, so you need to be aware of this and set your current limit conservatively. Here's a back-of-the envelope rough example: Suppose my primary current ring up is more-or-less linear and rings up at about 100A every half cycle. I want to make sure my IGBTs see at most 1000A, and this will happen in 5 full cycles. At the worse case, it takes about 1.5 half cycles to trip the OCD, hence the OCD should be set at around 850A or so. This will lead to turn off after a peak current of either 900A or 1000A depending on CT phase. For safety (physical isolation) and noise immunity, the control to the UD2.7 driver is via a 1-bit fiber optic input. UD2.7 uses the dual inputs introduced in UD2.5, allowing the use of both ST Fiber optic or Industrial Fiber plastic fiber optic. These optic lines are driven by an interrupter of your choice, (light on = drive on). Because the ST fiber is active low, the output is inverted once. These two inputs are effectively ORed together. Note that D13 should be removed if the IF receiver is not installed, and only one of the receivers should be driven at any one time. Notice that the IF-D95OC has a open collector output and the IF-D95T is a push-pull TTL output. Since they are active high (unlike the ST receiver which is active low), if these are not installed, the line will not be pulled low by the receiver (due to R11 pulling it high) and the interrupter line will appear to be constantly on. Hence D13 needs to be removed. Now lets look at the Over-Current Detector circuit. Again the OCD feedback is obtained via a current transformer much like the feedback transformer. The output is full-wave rectified, and loaded across R17 (5.1 Ohms). I usually try to wind my CT to get about 1A across my load resistor, or about 5V across the load. This goes into the LM311 comparator, which compares this voltage with a threshold voltage that is set by the multi-turn potentiometer R20. Again this goes into the CLR' of another flip flop to ensure an OCD trip independent of phase-lead feedback. This is ANDed together with the interrupter signal, and goes through two inverters before going to IC6B, the other flip-flop. Now (looking at IC6B), before the OCD trip happens, PRE' and CLR' are LOW and HIGH respectively, so irrespective of CLK and D, output Q is HIGH, so our driver is running. So when an OCD event happens, the output of AND (IC5C) goes to LOW, hence PRE' of IC6B goes to HIGH a short while before CLR' goes to LOW because the resistor-cap-diode network sets a bit of delay on the order of 100us before the 7414 hits its threshold HIGH voltage. Therefore IC6B sees HIGH and HIGH on PRE' and CLR'. Since D is pulled to LOW, on the next rising clock edge from the feedback, Q is then asserted LOW. 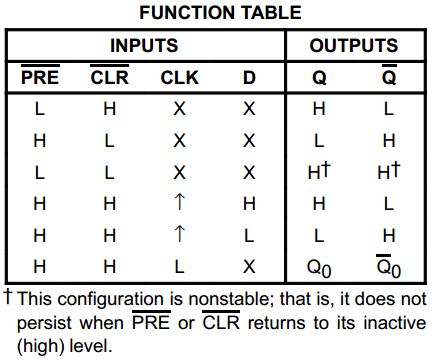 If a rising edge doesn't occur for 100us for some reason, then with H, L on PRE' and CLR', the drive is shut off anyway. This places a lower bound of Tesla Coil operation at around 10kHz for ZCS-turn off. UVLO is straightforward and originally suggested by Hydron from the forums. UVLO is an important feature and prevents under-driving of the IGBT gates if the 24V rail should fall to some low voltage, which could due to a power loss or a rail sag. Such an event could also create problems with the logic, so we want to shut down our drive in such an event. R29 and R30 (replaced by a potentiometer in B revisions onwards) and form a voltage divider on the 24V rail such that when it drops to below around 22V, it will cross the 2.7V (or 4.5V depending on part) threshold of the UVLO IC. C34 is added for noise immunity but can be omitted. For recovery, C25 sets the time which is about 1 second before it resets, with 1uF. The reset (RS) pin is an open drain output and is connected to the LM311 output. As such, it has the same effect as having an OCD event, pulling P1 of the 74HC74 to 0V, and the drive is shut off at the next current zero crossing and the OCD LED is turned on, until the 24V rail recovers and the interrupter is next triggered. Note that the above schematic is of the UD2.7A. The B revision onwards includes an extra jumper for UVLO enable/disable, as well as a potentiometer for adjusting the UVLO set voltage (via Tap Point 2). For similar operation, set the potentiometer R29 to be 33k (where TP2 = 3.0V). This voltage can be increased to add more leeway. 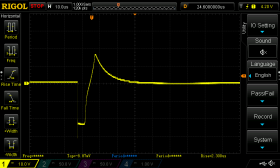 Note that the maximum voltage the LM8365 can tolerate is 6.5V. By default, R29 (50k pot) comes set to half (25kR resistance). 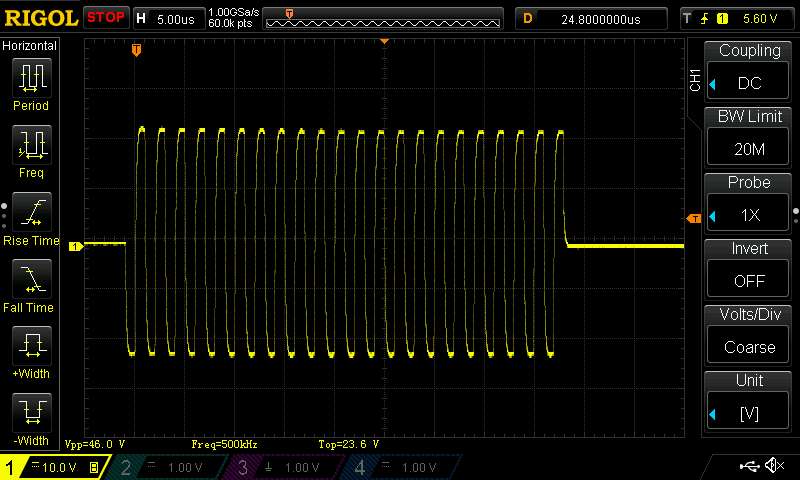 This gives a safe voltage of around 3.8V by default which should be adjusted. However, IF R29 is set to say 0R by accident before soldering in, this can place a very high voltage (>6.5V) to the LM8365 causing it to pop! Be careful when installing R29! Thanks to Justin on 4hv for pointing this out! Soldering the UD2.7 should be quite straightforward. I recommend soldering all the small SMD components before through hole components. 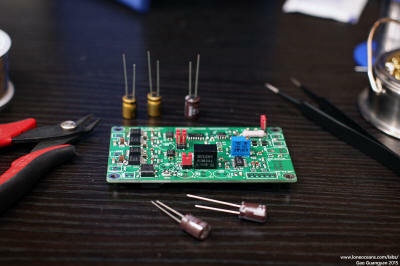 The power Mosfets may be tricky to solder and may require higher temperature soldering iron to heat up the pads, as do the voltage regulators on the other side. Other things to take note are the Polarity of the small SOIC chips. Also, D13 should be omitted if the black IF fiber optic is not installed. C33 has larger solder pads for easy changing of capacitor values. Finally, the right-most two mounting holes are grounded, while the left-most two are isolated. 4-40 or M3 sized screws are recommended for mounting the board / IF fiber receiver. Refer to the photos of the TOP and BOTTOM of the board above to get a better idea of how the component placing should go. I found it easier to solder everything SMD on the top side first before soldering the bottom side, followed by through hole components. I found a a small error on the PCB (both Rev A and B w.r.t. the 24VDC input) thanks to Daniel, but with a simple fix so no worries! This only applies if you are using 24VDC input. This error has been fixed in the UD2.7C. Problem: This happens when the 24VDC jack is used instead of the AC input of only the UD2.7A and B. The 24VDC jack goes directly to the 24V rail. However, the 9V switching regulator's input is not connected to the 24V rail but rather the rectified AC rail. I originally wired it this way to reduce added load on the 24V regulator, since the 9V switching regulator accepts up to 34V input. But it looks like I got ahead of myself! You would think that this meant that the 9V and 5V rails would not be powered, but it turns out that inside the 24V regulator, there is a diode in series with about 28k from the output to the input, hence allowing the regulator to 'conduct backwards'. This also explains why the board still checked out ok on the voltage rails, probably helped by the generous amount of logic bus capacitance and the fact that the logic doesn't draw too much power. Even without any fix though, the board seems to work fine powering coils hence explaining why I didn't see the error at first. However, probably a good idea to fix the problem. Fix: If you're using AC input, there is no problem. If you are using DC input there are two ways of fixing it. First, you can supply 26.5VDC into the AC jack instead - the diode bridge drops about 0.5V and the 7824 drops about 2V for 24V on the 24V rail. Most 24VDC power supplies usually have small adjust pot. Second way: If you're using the DC input, the problem can be solved by a simple fix - simply solder on a diode from the output to the input of the 7824 regulator (i.e. classic reverse protection diode). So when the 24V rail is powered via DC input, current flows across the regulator to the input of the 9V regulator. With this fix, even when powered via AC, the diode is simply acting as the classic reverse protection diode. The diode I used for D14 (GSD2004W-E3-08 - just order an extra one when you're in Mouser) as a reverse protection diode across the 9V switching regulator can be used for the 24V regulator, or any other general purpose diode will be fine. This can be soldered directly across the legs of the 7824 regulator and fits perfectly. Make sure the diode is from the output to the input. Above is a fix with a standard 1N4001 diode across the 24V regulator, on the V2.7A board. 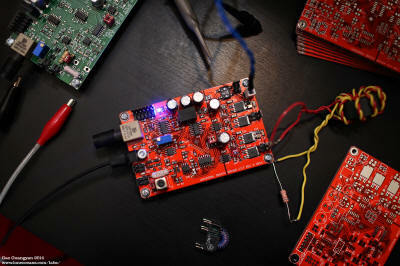 In the new V2.7 Rev C, I have fixed this error and the 9V regulator input is now powered from the 24V rail. 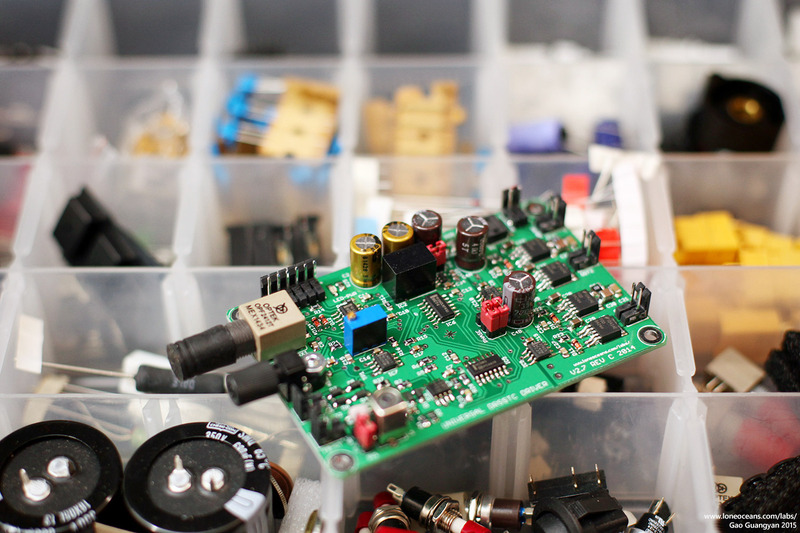 The UD2.7 is best tested with a current limited adjustable power supply at 24VDC into the DC input jack. Upon turning it on, the on-board SMD power indicator LED should turn on. At this point, check the three power rails to ensure that you have 24V, 9V and 5V. None of the components should get warm at all. Next, connect your fiber optic cable to the fiber optic interrupter of your choice. Attach a LED on the Signal LED jack (the middle pins of the 6-pin LED jack). Check that when the interrupter is running, the LED should light up correspondingly. This verifies your optical receiver is working. Take note that D13 must be removed if the IF fiber receiver is NOT installed. A quick way to verify that the board is working is using a signal generator running at your desired frequency to simulate feedback. Set your frequency / signal generator as a sine wave of around 5V amplitude at your desired frequency (e.g. 100kHz). Connect this to the input of the Feedback jack (not the OCD jack). Now connect the ground of your oscilloscope to the ground of the board and scope the outputs of the gate drive, and turn on your interrupter. 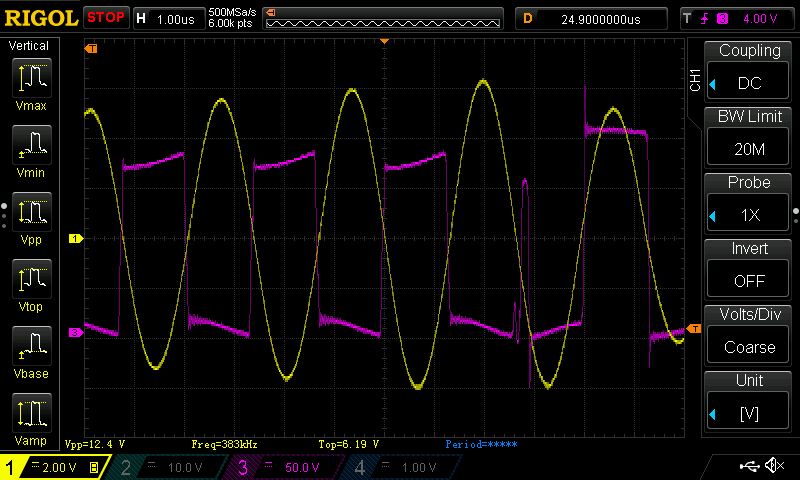 You should see the above 50% duty cycle square wave at +24V at the input frequency of your signal generator. The example above shows one of the GDT outputs running at about 53kHz at a pulse width of about 85us. Because the UD2.7 implements a flip-flop for zero-crossing turn-off, the gate drive should always end at a transition point. The amplitude should be single-sided 24VDC with a 50% duty cycle. If you see this for all four GDT output pins, your driver is working as expected. With NO GDT connected, the driver should be quiet. The driver creates a +- 24V output for the gate drive transformer. To verify this, I made a very quick lash-up transformer for test. Note that this is NOT an ideal GDT - please wind a better one for your own DRSSTC (these scope shots show too low primary inductance - can be solved by adding more turns, but this was just a quick lash-up to show the driver working). Above shows the secondary of the GDT across a small resistor at 50kHz and 500khz. The photo on the rightmost shows a situation caused by an incorrect C33. Note that if you have no input signal in your FB jacks, the driver will not see any feedback, causing the drive to lock up. 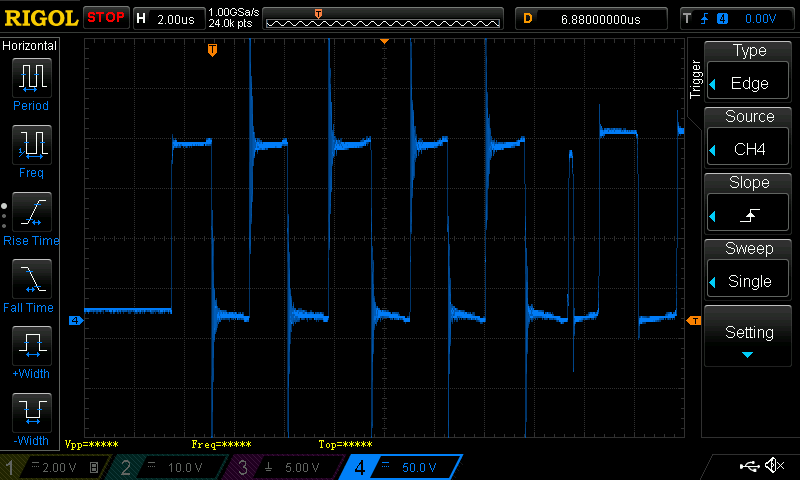 Here's a scope shot of a GDT output with a feedback input signal (left). But if you have a GDT attached with no signal generator input on the feedback, this will make a signal on the output of the GDT look like the above (right - where the driver doesn't know what to do), and will cause quite a loud audible buzz from the GDT with this associated output per pulse. This sound should diminish greatly with a feedback input signal. At low frequencies, you might notice your GDT saturating. This will cause very unstable, ugly switching, and the result will also be a very erratic and audible buzz on your GDT, as shown in the three scope shots above. Fix this by making a better GDT. You should adjust C33 to suit your needs. For example, the use of 2.2nF for C33 limits the maximum frequency to at most ~250khz, resulting in a bad drive (right most image). If you see this, change C33 to a smaller value (220pF to 1nF), or reduce your frequency. Note that the output is +-24V. At this point, your driver should be ready for basic operation. I have tested the UD2.7 all the way from 12kHz to 1.04MHz (whereas 220pF seems to be good from ~150khz upwards). 1nF should be good for most applications. It is also a good idea to test the under-voltage lockout and OCD. To test the UVLO, continue scoping the output with the interrupter on, and slowly turn down the voltage from your adjustable DC power supply. 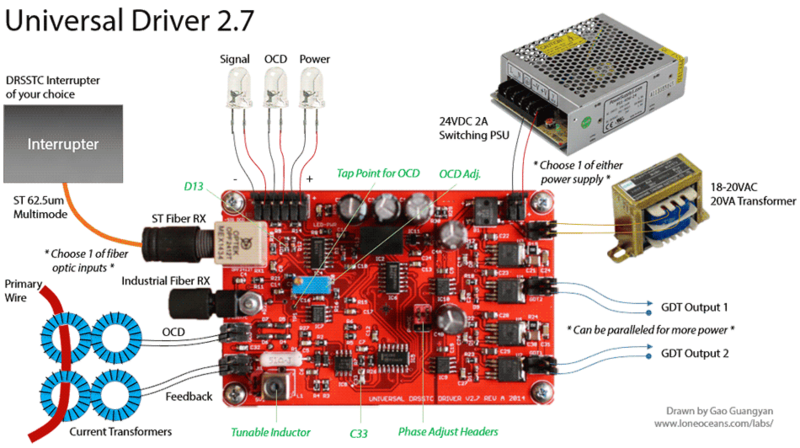 Depending on the tolerances of your voltage divider on the UVLO, the output of the driver should stop once it drops below around 22V and the OCD light will remain on. The minimum lock-out will be about one second or so, before coming on again when the 24V rail recovers (can be changed by adjusting the value of the 1uF capacitor). OCD is tested the same way by increasing an input sine-wave voltage until the set level. At this point, the OCD light should turn on and the output will stop. Phase lead can be adjusted by choosing an appropriate adjustable inductor and carefully adjusting it to suit your Tesla Coil. This is the way I usually tune my coils for phase lead. First determine the general operating frequency of your DRSSTC. In the example shown in the scope shots above, I am running my DRSSTC at about 380kHz. Run the DRSSTC without the secondary coil in place. I usually use a metal object as a load in the middle of the primary coil. This could be as simple as a metal pan with some water inside, or a block of steel. Next, power your DRSSTC as usual, but with a lower bus voltage if desired. Note that to take scope measurements, you should isolate your entire drive circuit! This is very important. 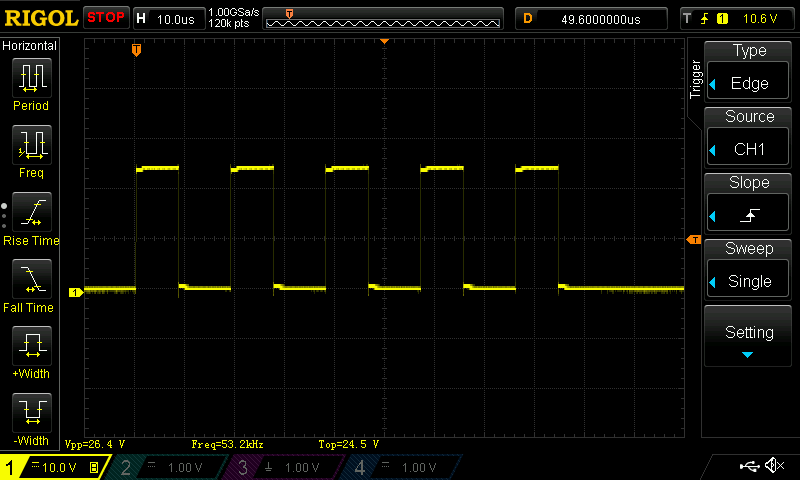 In the example above, I am running my bridge at about 170V bus. The blue trace shows the Collector-Emitter voltage of one side of the bridge showing the output of the bridge with no phase lead (this can be set by the jumper beside the tunable inductor). Note the huge spikes during the transitions greater than 100V! These can kill IGBTs since IGBTs are extremely sensitive to over-voltage, and it is very difficult to get rid of these spikes even with a low inductance layout due to the intrinsic component inductance which cannot be removed. I then tried a few different inductors (see quick notes above for which values to use), and adjusted the phase lead while looking at the scope. As you move closer to the sweet spot, you will notice the spikes dropping in amplitude all the way until they.. suddenly disappear. This is the sweet spot and your coil is tuned appropriately. It will be impossible to completely eliminate all switching spikes. What I do is to ring up the primary (by adjusting the pulse width on my interrupter) until it hits a current I plan to run the coil at. 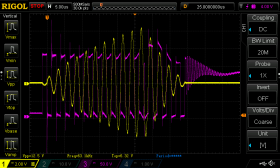 In scope shot 2, you can see the primary current (yellow) versus the bridge output (pink) with phase lead. At this point, the current ramps up to about 130A. I have also adjusted the phase lead such that the spikes are the smallest at the last few cycles when the current is the highest. The third scope shot shows a close up of shot 2, showing beautiful, clean switching. This point is achieved at a type of switching known as zero voltage switching (ZVS). In this case, the IGBTs are switching not at exactly at zero current, but at zero voltage. The best way to visualize this is to overlay the gate-emitter and collector-emitter voltage of one of the IGBTs during operation. What you want to see is when the opposing IGBT turns OFF, the bridge voltage begins to fall to 0 and invert. Note that IGBTs really turn into a conductive state as the gate voltage reaches a plateau around 10V. So when scoping the gate voltage, you will see it rise up quite fast, plateau at ~10V, before shooting up to 24V of the gate drive. 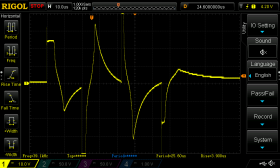 The trick is to adjust phase lead such that just when the bridge voltage transitions at 0V, the gate is at this plateau, and all ringing should disappear. For more details, scope shots and tips on choosing a suitable gate resistor, see my DRSSTC 3 page where I walk through this procedure in detail. In summary - set your bridge for ZVS which will lead to the smallest spikes. Aim for the cleanest transitions at the highest current. I found that setting for a clean transition at about 20 to 25% of expected peak current usually leads to good results. Setting OCD on the UD2.7 is as simple as adjusting the large variable resistor R20, and measuring the voltage at tap point 1 TP1. For example, lets say we are building a DRSSTC where we do not want the IGBTs to see more than 700A primary current. Note that by design, the UD2.7 only switches the transistors OFF during a zero current crossing via a flip-flop (this is to prevent switching off the IGBTs when huge currents are flowing). This means that even after the OCD trips (say while the current is ramping up during a quarter RF cycle), the current can continue rising to higher than the OCD trip point for up to 1.5 half cycles before it goes back down. Therefore, we might want to set our OCD point to 600A or so. Next, count the number of turns on your primary current transformer. Lets say we have a 625:1 current transformer made by cascading two 25:1 transformers. Therefore if 650A is flowing in the primary, we will see 1.04A in the OCD CT. This current is full wave rectified and flows across the burden resistor R17 (5.1 ohms). By ohms law, at maximum current, we will see 5.1 x 1.04 = 5.304V across R17. Therefore, adjust R20 until TP1 shows about 5.3V and you're all set! Note that for larger coils running at say 2000A with a 1000:1 current transformer, another burden resistor can be placed along-side R17 (R28), to reduce the burden resistance. Note that the comparator LM311 has limits at its 9V VCC voltage (minus some since comparators are not accurate near the rails), so make sure the trip voltage is less than say 8V or so. The UD2.7A has been tested to work extremely well in QCW DRSSTC operation. See my QCW 1 page to see it in action. However, it was certainly not designed with QCW operation and therefore you should understand its limitations which is out of scope for this page and obvious to the skilled coiler. Some modifications should be made to the board for proper operation. This mostly relates to the long drive required by QCW operation, where the driver has to switch IGBTs for several thousands of cycles instead of around 10 or so in normal DRSSTC operation. The result is that the 24V voltage rail may drop to a dangerously low level due to insufficient 24V rail capacitance and / or insufficient logic power from say a 20VAC transformer. Fortunately, the UD2.7A has an under-voltage lock-out, which will prevent your IGBTs from desaturating and blowing up when the 24V rail drops too low. However, it might limit the pulse width you can drive your IGBTs. In addition, QCWs usually operate at around 300 to 400kHz, and correct selection of C33 is required. I found using C33 = 220pF works great for high frequency operation. Solder 220pF on C33 for 300 - 400+kHz operation. Add extra bus capacitance on the 24V rail. You can simply replace C4A and C4B with higher capacitance electrolytic capacitors, or tack on a few extra outside the board. The default values for C4A/B at 8mm diameter 35VDC 220uF capacitors. I found adding an extra 1000-5600uF capacitor works great depending on your application. There is space on the UD2.7B/C board just for purposes like this (C4C). Iron transformers are usually unable to supply enough power to the board for QCW operation. Another alternative instead of adding extra capacitance on board that works great is to use a 24V switch mode power supply as a power source (instead of a 20V transformer). These supplies usually have an output filter capacitor as well which gives extra bus capacitance. You may find that the 24V rail voltage can still drop to 22V, triggering the OCD. Another way to fix this is to simply lower the OCD trip voltage by lowering the resistance of R29. This can be easily done by kludging another SMD resistor (say several hundred kOhm) over R29 in parallel with the existing 33k resistor. The UVLO IC can be left-out all together, but I do not recommend this. Your IGBTs will explode if they desaturate with several hundred amps through them. 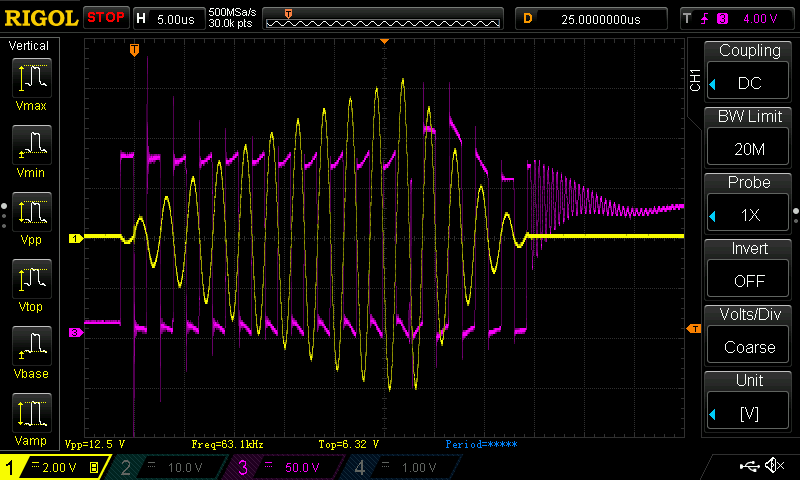 UD2.7B and C replaces R29 with a 50k potentiometer for adjusting the UVLO voltage threshold. Loneoceans Laboratories. Copyright (c) 2003 - 2016 Gao Guangyan, All Rights Reserved. Design 3.